After saying good-bye to our family, we spent Tuesday at a music clinic put on by Augsburg Fortress Publishing. Each year the publishing company puts on a series of clinics across the country to let church musicians know about new music. The clinics are run by some of the composers whose music is being highlighted. 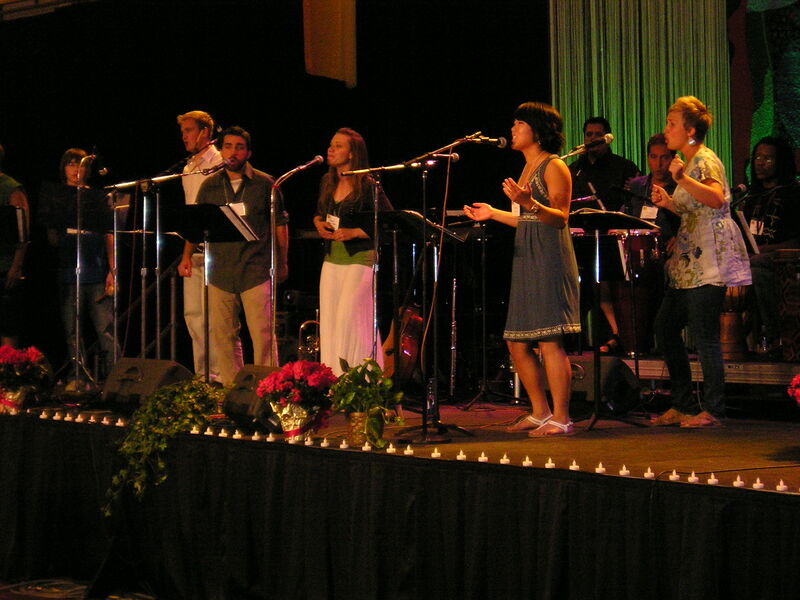 The group that gathers gets a chance to sing through the music together. It’s really something to hear a couple of hundred voices read through the choral literature. What a great gift God has given in music. There is something about music that helps us in our praise of God and helps us express our feelings in ways that we can’t do with just words. Mary Jo says that she found a couple of pieces of music to use with our choir this fall. 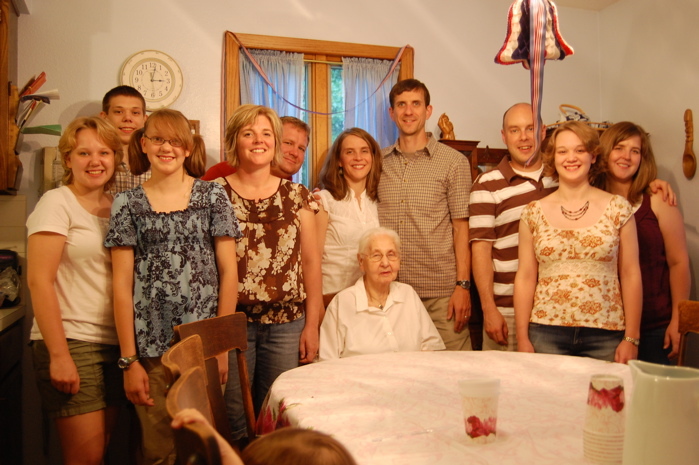 On Sunday, we traveled to Northwood, Iowa, where we had the blessing of celebrating my mother’s 96th birthday. 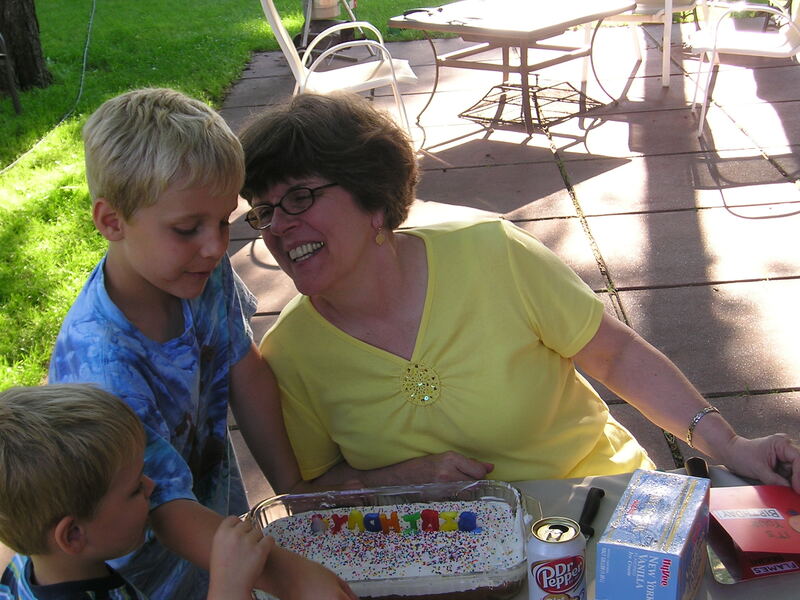 She had her four children, 7 grandchildren (and 3 spouses), and 4 great-grandchildren present for the celebration. Marie and Ruth, my sisters, provided a marvelously varied lunch as gathered around two tables to eat. Lots of laughter, noise and commotion filled the house. 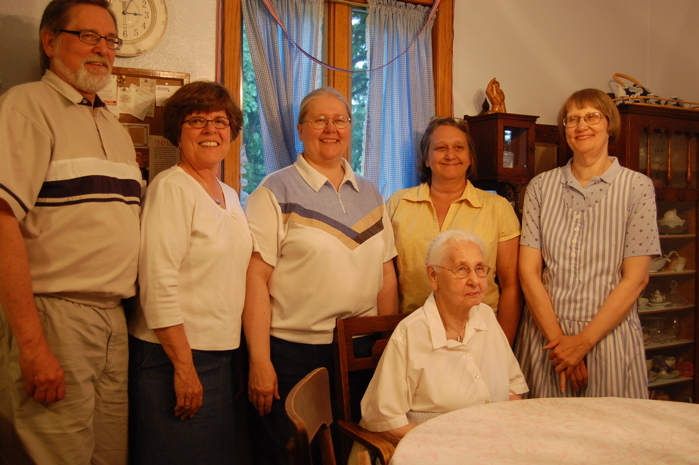 After an afternoon of visiting, my sister Anne and family and Kjerstin and family needed to return home, but some of us were able to stay and return Monday morning for an hour or so before we all headed out. Below are some pictures from the event. Bestemor and Ezra, Bestemor and great-grandchildren, Bestemor and grandchildren and spouses, Bestemor and us kids. 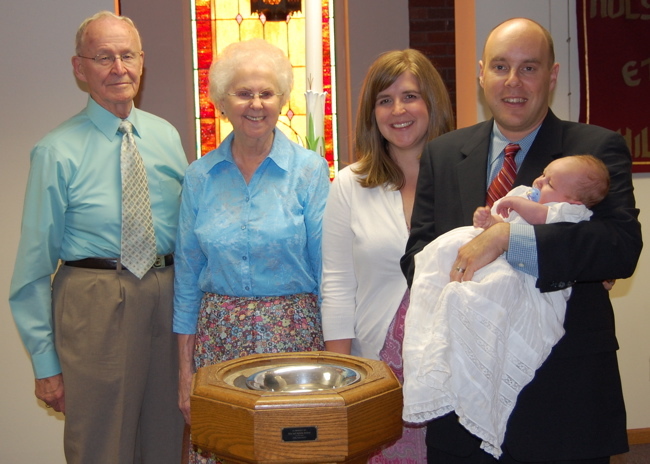 Ezra Kyle Bersagel-Briese was baptized on Saturday, July 26, 2008, at Our Savior’s. 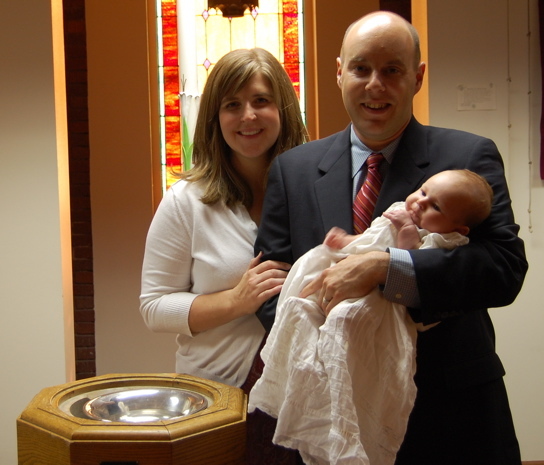 It was my privilege to baptize him and to preach that night. 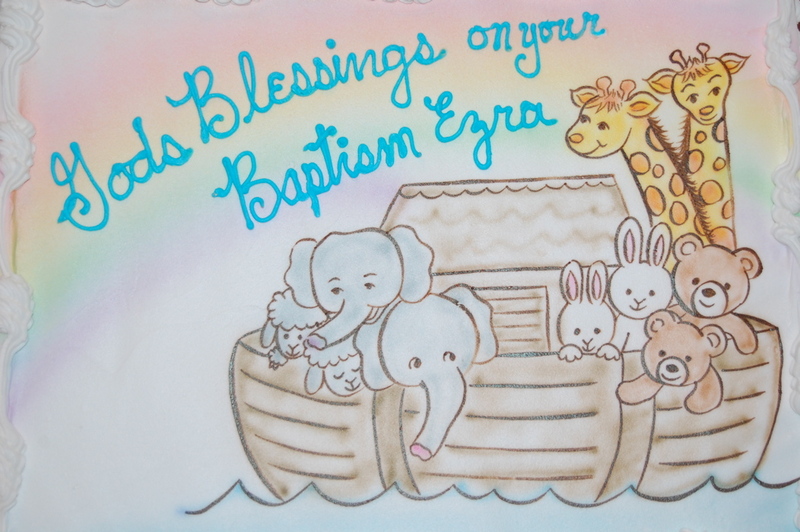 The sermon was a letter to Ezra that I hope he will have a chance to read some day. It was very special to have this opportunity. I’m grateful to the folks who gather on Saturday night to allow me to take a hiatus from my sabbatical for this event. 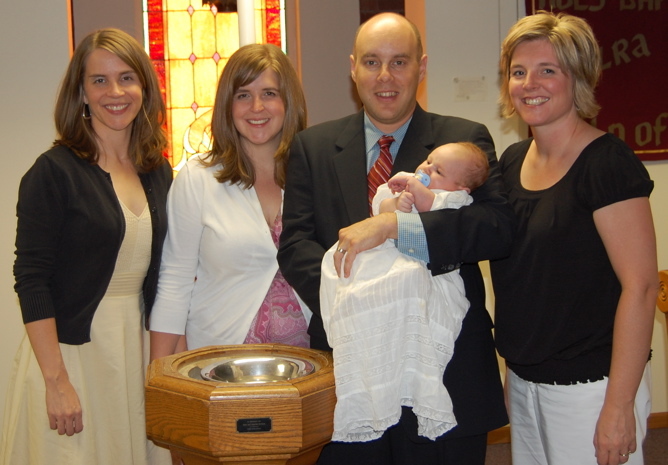 Here’s some pictures from the baptism. 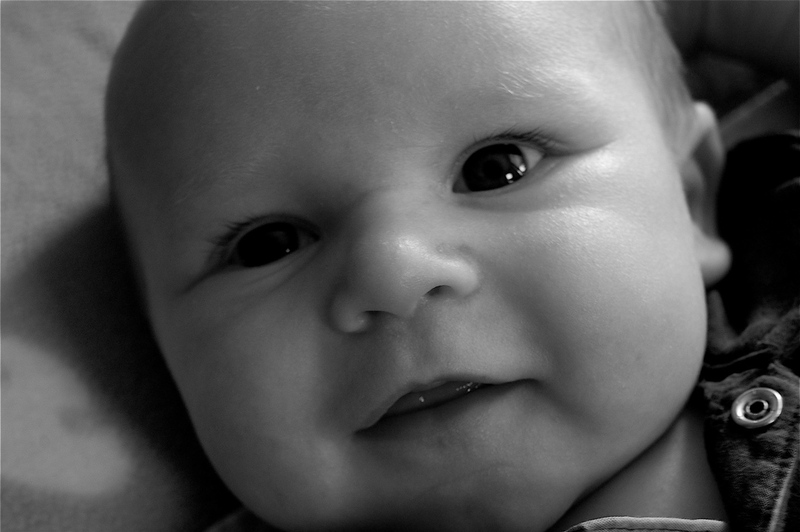 The pictures are courtesy of Oren Briese, Ezra’s father. I’ve spent the last few mornings getting excited again about Bible Study. Maybe that sounds strange for a pastor, but it’s true. Along with many people, it can sometimes seem to me that the Bible is boring, or simply a history book, or really has nothing to do with our life today. But the truth is that the Bible is exciting, engaging, and all about us and our struggles in life. It’s about God’s work in our life. It’s God’s love letter to us. 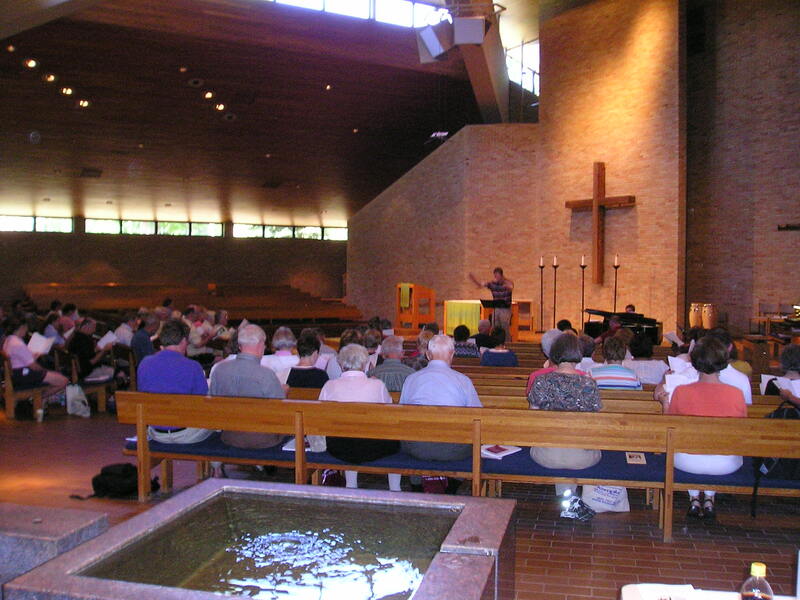 Sitting here at Luther Seminary, St. Paul, MN, I’m reminded of attending school here in the late 1960’s. 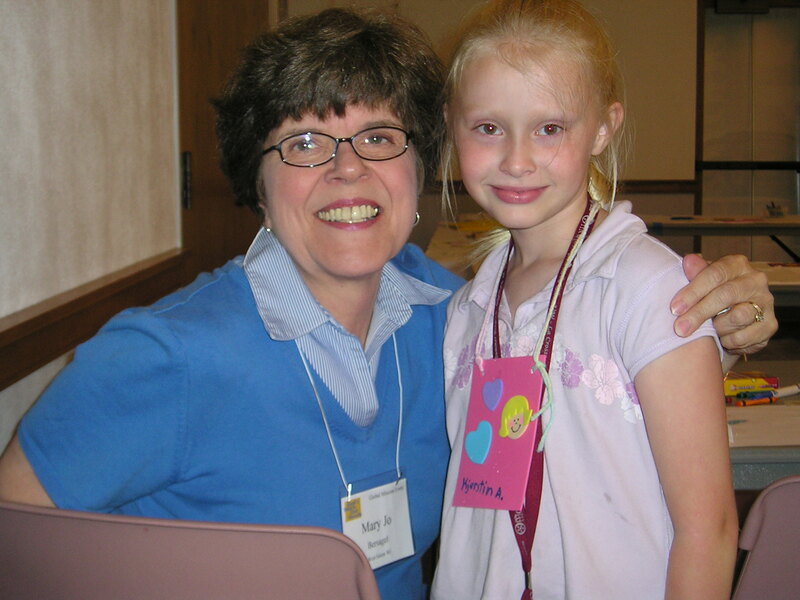 Part of that experience was that Mary Jo was still a student for two years at Augustana College in Sioux Falls, SD. There wasn’t email. There weren’t cell phones. There was no facebook, no texting. What we had was “expensive” long distance calls and letters. How many times a day do you suppose that I checked my mailbox to see if there was a letter from Sioux Falls that day? More than once, I can assure you. I wanted to hear about what she was doing and to hear that I was loved. I don’t know about you, but it’s embrassing for me, to realize how few times I check to see what word God has for me on any particular day–just to find out what God did and is still doing and to hear again that I am among the loved. 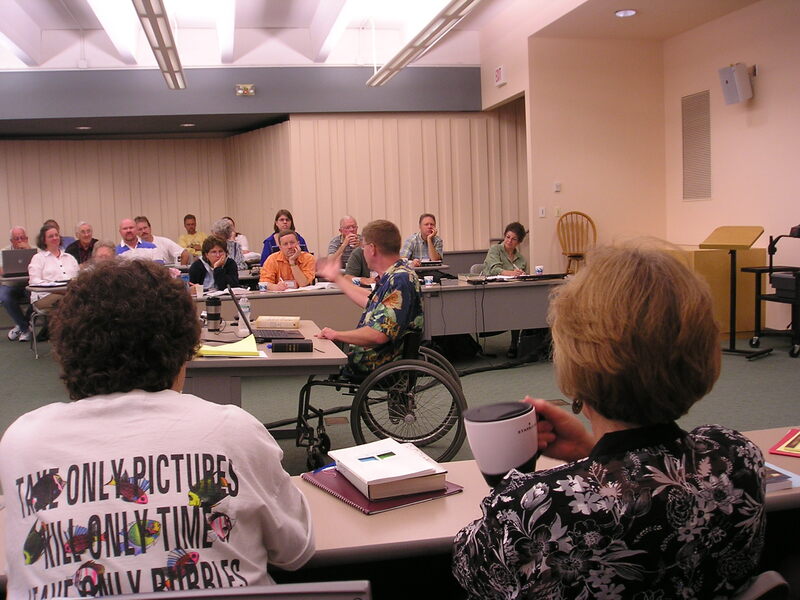 How can those of us at Our Savior’s engage the Bible more so that God can work some transformation in our lives? Here’s a couple of shots of our classroom and a couple of the teachers we engaged with. Week seven-Now what? Where do you need balance? These are the week seven questions for you as you walk. 1. What have you learned about your physical, emotional, intellectual, social, spiritual, and vocational well-being? 2. Rate your need for change in each area. 5. Live prayerfully. Pray for God to motivate and surround you with support as y9ou strive for greater balance. If you fall short, remember that you are forgiven and ask God for strength to begin again. I hope by the beginning of next week to set some goals of my own. I’d be interested in what goals you might set. Think about that this week. What he was saying is that God is at work in the world. God’s work is creating, preserving, reconciling, repairing the world. To do God’s work is the reason Jesus came into the world. As those who have been called as disciples of Jesus we now pick up his work. God calls us to create, preserve, reconcile and repair the world in which we live and to do so in God’s name. God uses our hands to do God’s work. This past week we were encouraged on the “Road 2 Emmaus” to consider our vocation, our calling. We have callings as individuals, but also as a church. Our whole reason for existing is to be about God’s work in the world. How will we as church be the hands of God that do God’s work? How will we serve the world in ways that create, preserve, reconcile, repair? This is our vocation. We don’t have pictures, but we walked in Thailand and Russia today. We heard a professor from Thailand who works to create dialogue in her country between different groups including her own Buddhist group and Moslems in the south of her country. Tonight it was a Lutheran from Russia. There aren’t many Lutherans in Russia, but he gave one of the best defenses for the Lutheran understanding of the Christian faith that I’ve heard. So it was a very good day. The music is great, and we are remaking some relationship with old friends. I also attended a workshop on church size as well as workshop about Lutheran Health Care Bangladesh. Mary Jo has workshopped with the great musicians at the event. 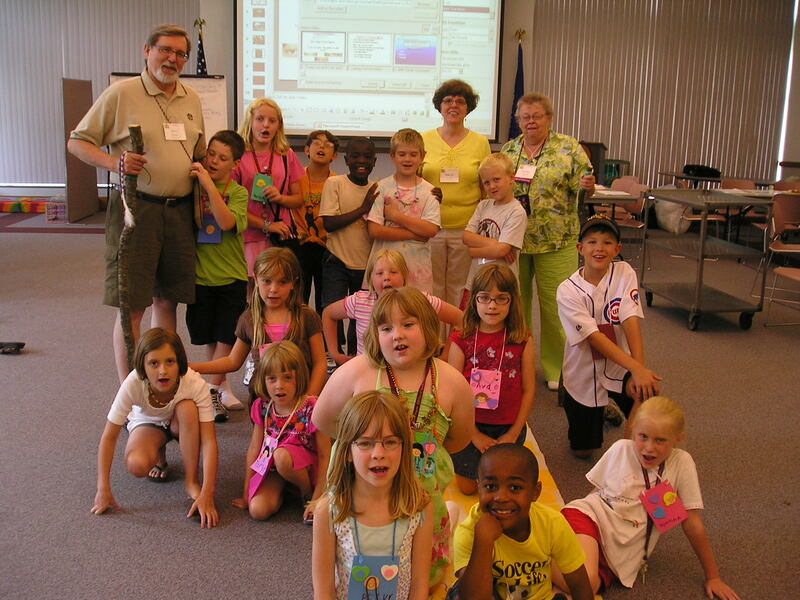 When we visited the children’s ministry center they were making walking sticks. So we made one too, and had our picture taken with the sticks and the kids. Since walking is a theme of this blog, it seemed right to make a walking stick. As part of our thinking about our vocation as Christians, we’re attending the national Global Mission Event held this year in La Crosse. At the bottom of the page are several photos from last night and today. I saw several folks from Our Savior’s at the opening worship last night. Mary Jo and I are helping out by checking in on the children’s program at their snack time. 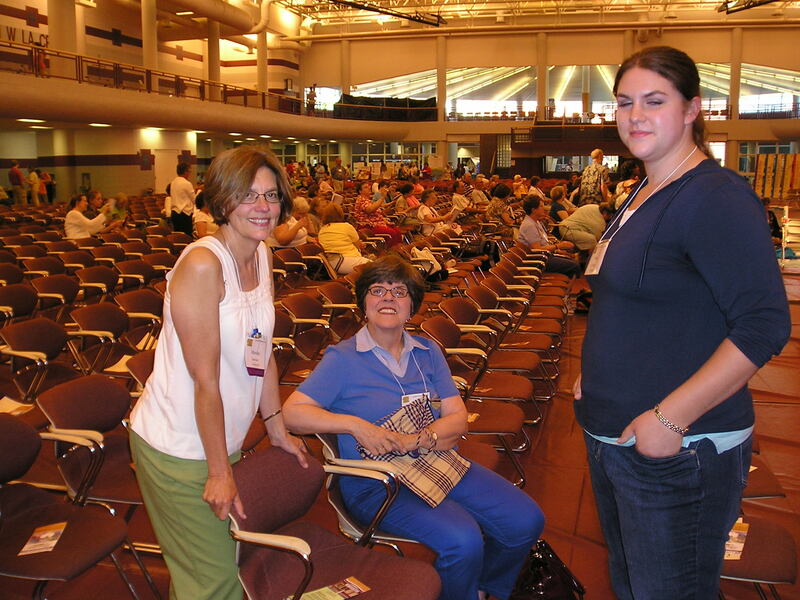 Mary Jo sat down next to a little girls whose name is Kjerstin, the name of our oldest daughter. 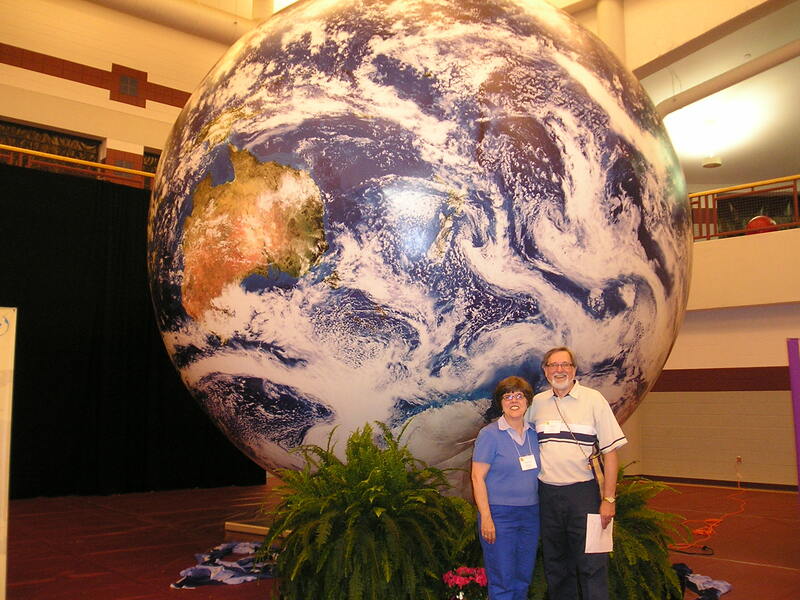 The big globe is a focus of the room. We heard speeches from people from Argentina, Africa, and around the world. We’re attending several workshops and seeing some old friends inthe process. I had the privilege of helping lead worship tonight along with a college friend of Ahna’s, Callie (Brown) Isabelle. 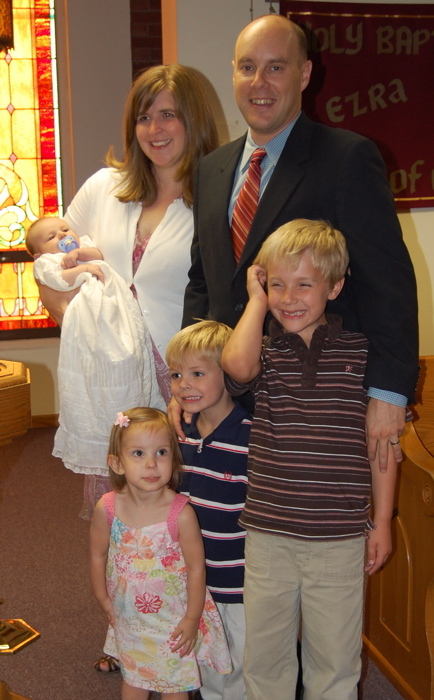 Marsha Bateman has served as local worship coordinator. Malory Hendrickson has participated in worship last night. Sara Hanssen participated with Mary Jo tonight too. You can come and experience the Globab MIssion Event at 10:30 a.m. on Sunday morning at the Eagle Recreation Center at UWL. Grandps, come here, please. Grandma, please can you help me! Pappa, sit here. Nanna, read book! Grandpa, grandma, I love you! 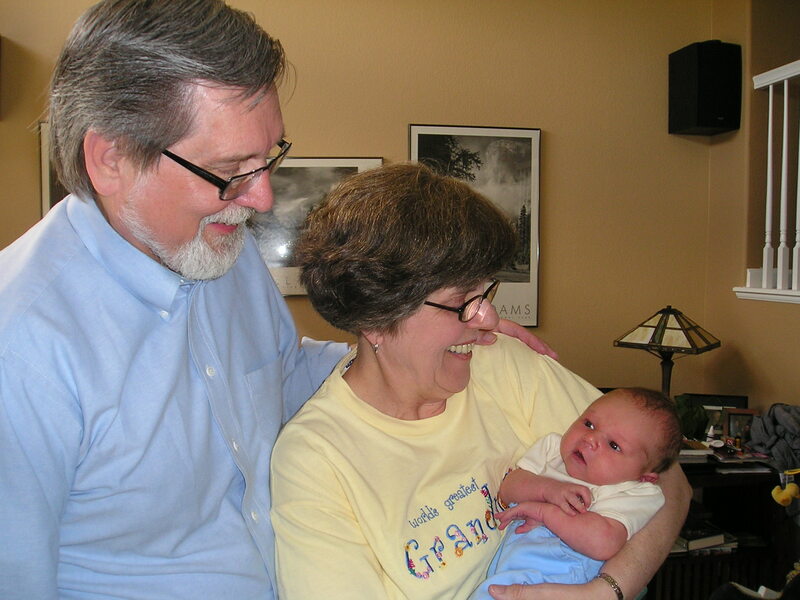 In this week of vocation consideration, we remember that many of us are called to the vocation of grandparenting. It is God’s call to love unconditionally, to nurture, to support, to enjoy. 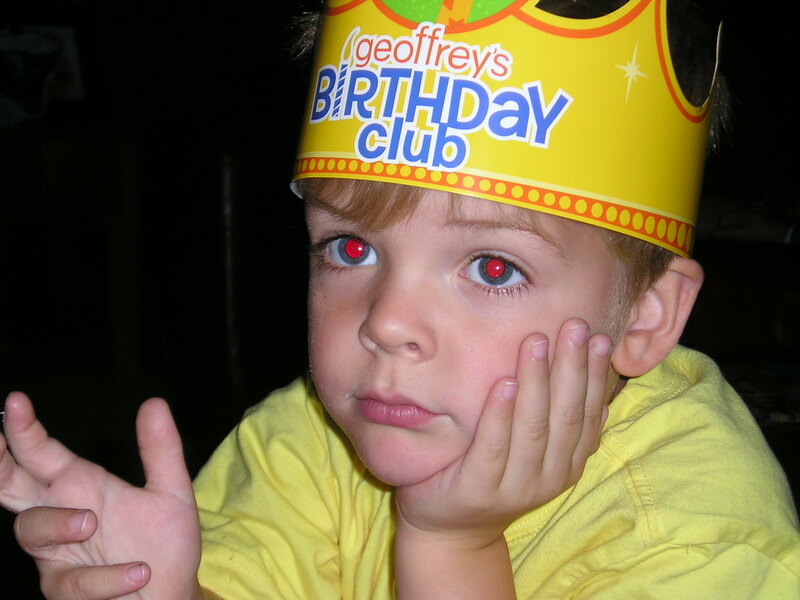 It is Isaac Smith’s 4th birthday today. We are in Sioux Falls, SD, to celebrate with him. We’ll gather with his other grandparents (his next-door grandparents) some cousins, aunt and uncle and even his great-grandmother to celebrate his life. 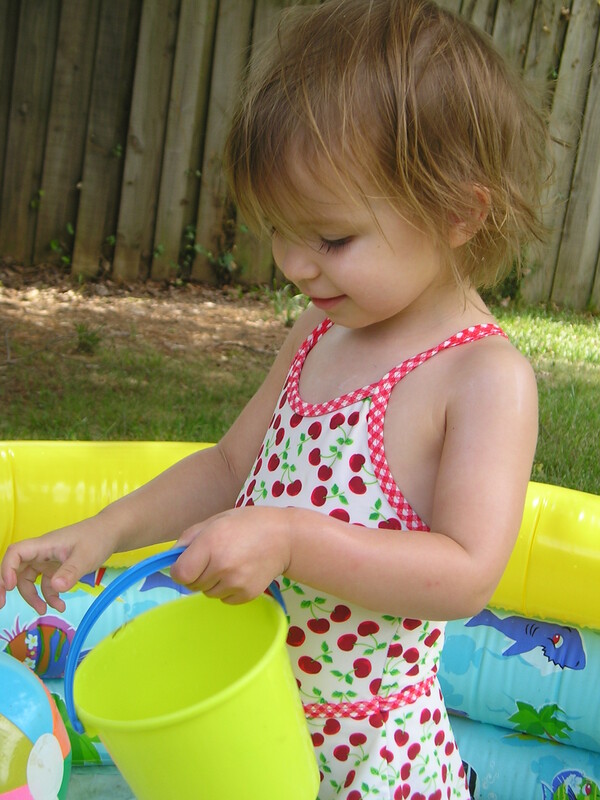 It’s one of the joys of grandparenting. To parent is important, God-given work. It’s hard work often, but also deeply rewarding. To grandparent is also God-given work. It’s mostly reward with just a little hard-work thrown in on occasion. We’re grateful today for this work. We’re home for a day or so. It’s a bit of a sad day on Leonard Street. 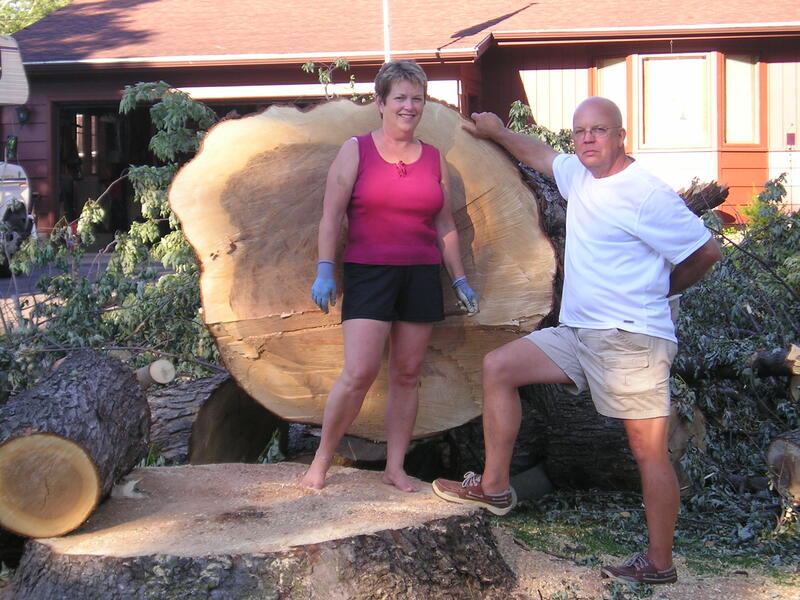 The huge tree in front of Steve and Fran Noffke’s house had to come down. Earlier in the summer it had dropped one of it’s huge branches that was already hollow on the inside. It was no longer safe to maintain this ancient gnarled tree. The people who took it down estimated that it might have stood in that spot for 150 to 200 years. (See picture.) Seeing it lie on the ground today reminded me of the four huge hackberry trees that had graced the parsonge backyard for up to 75 years. But there was an end to their usefulness except for the warmth they gave in someone’s fireplace or furnace. So now an ending for a tree that seemed like it would go on forever. Endings. Our daughter Kari had two cats, Chasa and Scout. This summer Scout got pretty sick with kidney disease. There really was nothing to do but to put her down. Any of you with pets know that isn’t an easy decision to make. But life is full of endings. A pastor friend just finished 38 years of ministry and is retiring. It’s an ending that isn’t easy, an ending to faithful care of responsibilities. It’s an ending to a pattern of life. 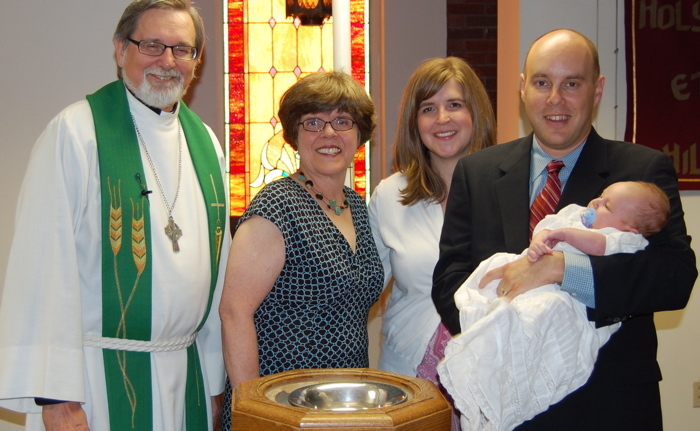 He sees it as a new beginning for a different kind of ministry in his family. Still an ending. We live in a finite world which means that all things have an end: trees, cats, vocations. We grieve those endings…even as we live with hope in the promises of God who has no end.